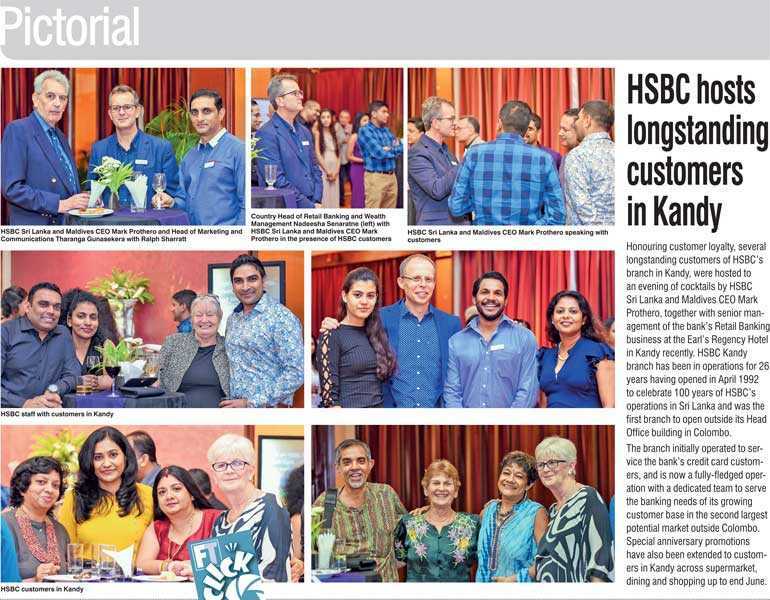 Honouring customer loyalty, several longstanding customers of HSBC’s branch in Kandy, were hosted to an evening of cocktails by HSBC Sri Lanka and Maldives CEO Mark Prothero, together with senior management of the bank’s Retail Banking business at the Earl’s Regency Hotel in Kandy recently. HSBC Kandy branch has been in operations for 26 years having opened in April 1992 to celebrate 100 years of HSBC’s operations in Sri Lanka and was the first branch to open outside its Head Office building in Colombo. The branch initially operated to service the bank’s credit card customers, and is now a fully-fledged operation with a dedicated team to serve the banking needs of its growing customer base in the second largest potential market outside Colombo. Special anniversary promotions have also been extended to customers in Kandy across supermarket, dining and shopping up to end June.